Their days usually start with listening to the weather. And are filled with doing what they love: fishing. Not slave to traffic patterns so much as the winds and currents, they harvest the food we eat in ever changing conditions. Seafood Demonstrations by the pros! San Diego’s fishermen* harvest a diverse array of species: from swordfish, the most cunning of catches, to sea urchins, the sessile ocean starbursts. From 60+ species of rockfish which most restaurants call snapper to opah, a warm-blooded newcomer on the San Diego seafood scene with three distinct cuts of meat ranging from the fatty belly to the beef-like abductor muscle. Plus albacore, sardine, snails, whelks, black cod, octopus, spot prawns and more. The list of our local abundance goes on. “San Diego is a unique location for the seafood industry in the world. We have a large diversity of year-round species. We have seasonal migrations of pelagic fish. And we have weather that makes seafood available year round.” – Kelly Fukushima, first generation San Diego fishermen. On Saturday, February 25th, San Diegans have the opportunity to meet some of our local independent fishermen. The folks who chose a life of constant change – weather, regulations and fish availability – to provide our food. Slow Food celebrates these food producers. Box crab demonstrations all night and sea bass breakdown at 7pm. U.S. fisheries are among the most stringently regulated in the world. *Most people who fish commercially, whether man or woman, prefer the term fisherman over fisher, fisherwoman, etc. On August 24th, stakeholders of San Diego fisheries began meeting with Protea Waterfront Redevelopment about their plans to redevelop the Downtown waterfront. This meeting was important. That the fishing community is meeting at all with the likely developer may affect whether our local and sustainable seafood industry will persist, diminish or flourish in the redevelopment. Learn more about good, clean & fair seafood in San Diego. Today, San Diegans have little access to locally-caught seafood, even though we are a waterfront city. The U.S. imports over 90% of its seafood and San Diego fishermen are hard pressed to sell their catch locally. The redevelopment represents an opportunity to invest in our local fisheries and reconnect with our local seafood system. It's up to the San Diego to commit to this. Want to help? Write a letter to the Port of San Diego in support of local commercial fisheries and sustainable seafood. Go here. While it is still early in the planning process, it is important that we let the Port (and City and County) know now that San Diego wants to support a thriving commercial fishing industry by keeping Tuna Harbor solely as a working fishing harbor. One of the early draft alternatives presented by Protea for Tuna Harbor shows a mixed use harbor, combining fishing with another yacht club. This would reduce the number of slips and total space allocated to fishermen, and create unsafe conditions with little room to maneuver boats and allow for daily boat traffic. Plus, “Creating a mixed-use marina conflicts with the Port Master Plan which delineated this area, among others to commercial fisheries,” says Halmay. The preliminary plan also reduces the size of the on-site processor and sets it back from the water behind retail stores and a taco shop. “Santa Monica Seafood provides vital services to the fishermen: ice, loading dock, crane, etc. We need these things to operate and keep our seafood fresh.” While this plan is only one of several draft alternatives, it reveals the extent to which commercial fishing could again be reduced in San Diego. Setting commercial fishing as a priority in San Diego needs to happen now. At the 2nd meeting in September, facilitated by Dr. Theresa Talley of SeaGrant California, stakeholders chose Mike Conroy, of the American Albacore Fishing Association, to Chair future meetings. They also presented their vision of Tuna Harbor, which is a single use harbor for commercial fishing vessels only, including necessary infrastructure like cranes, squid pump, freezer and net mending space plus, signage illustrating San Diego's fishing history and present, and an open-air fishermen's market. The vision maintains Santa Monica Seafood and their infrastructure, as well. All intended to support the current and likely future local fishery. Click here for larger version of fishermen's sketch. San Diego needs fishermen to harvest our seafood. It’s not much further for us to get to importing 100% of our seafood. The redevelopment of the Central Embarcadero represents an opportunity for San Diego to invest in its fisheries, in its local seafood system, in community. We can make room for more yachts and chain restaurants or we can invest in Good, Clean & Fair Seafood for All. The success of Tuna Harbor Dockside Market, the popularity of restaurants serving local seafood, and the move to eat locally, all point to the potential of our local fisheries. Maintaining and improving the fishing infrastructure at Tuna Harbor will keep locally-caught sustainable seafood in San Diego. Keep San Diego Local. Support your local fishermen, and fresh, tasty local seafood. Watch this video to learn more about the value of San Diego commercial fisheries. San Diego's sustainable seafood needs your help. San Diego's fishermen need your help. Our good, clean & fair seafood system needs your help. Send a letter to the Port of San Diego and ask them to support a healthy, local seafood system and a distinctly local Downtown waterfront. More details below. Attend the Port of San Diego meeting to review the proposals October 13th. Provide public comment in support of our local fisheries. Details here. Support good, clean & fair seafood for all San Diegans. Help maintain our access to some of the most sustainable seafood in the world by sending a letter to the Port of San Diego. Points to include in letters and contact information for Port Commissioners and staff are below and downloadable here. A world-class community fishing commercial fishing harbor on the Embarcadero is a crucial and beneficial part of the fabric of the waterfront and the San Diego community. Our fishing harbor and the people within provide food security, economic value, legal consistency, and strengthen connections to our history and culture. We encourage the Port to work with the San Diego fishing community to ensure that their needs are incorporated into the redeveloped waterfront. Please ensure that San Diego fishing will have the infrastructure, visibility and community involvement it needs in order thrive. San Diego fishermen provide food security. San Diegans want access to safe, secure and healthy food. While 90% of the U.S.’s seafood is imported, with most from unknown origins, San Diego fishermen provide a local source of traceable seafood. This seafood is a safe, secure, healthy and affordable option for the community, and is some of the most sustainable seafood in the world. San Diego fishermen contribute economic Value. The San Diego fishing industry has an extensive economic value to our community and this should be maintained. The San Diego fishing industry supports 130 commercial fishing vessels, including crew members and their families. In the San Diego area, 2.3 million pounds of seafood were landed in 2014, at a value of $10.3 million. Our commercial fisheries bring other values to San Diego including: networks, stewardship, lifestyle, income, fishing expenses, gifting and trading seafood, culture and tradition, education, spiritual, intergenerational, and transportation. The Port should maintain legal consistency. The Port should redevelop the waterfront in a manner consistent with local and State plans and acts that protect the coast and its people and consider proposals for Central Embarcadero development. Redevelopment should meet the requirements of the Unified Port of San Diego Master Plan and the Commercial Fisheries Revitalization Plan to maintain a working fishing harbor at this location; the State Land Commissions Public Trust Doctrine that holds the waterfront in trust for the people of California; and the Coastal Act that states that fishing harbors should be maintained. We want to maintain our history and culture. San Diego wants fishing operations in sight. Downtown San Diego is the cultural and historical home of San Diego fishing. Young San Diegans need the opportunity to view fishing and consider it as a viable line of work in order to keep our food sources secure. Once fishing is not visible, it will disappear along with the food security, economic stability, jobs and local identity it provides. Please keep our local sustainable seafood system within reach. San Diego deserves a thriving local food system, of which fishing is an integral and respected part. We want access to fresh, healthy, sustainably sourced seafood, that we can afford. A thriving fishing industry in Downtown San Diego is critical to this future. Downtown San Diego, like many other downtowns, has its share of large hotels, chain and non-local retailers and restaurants, and a lack of fresh, locally sourced food. Redevelopment represents an opportunity to highlight San Diego’s local treasures and create a beautiful, unique, accessible, and purposeful world-class waterfront. San Diego deserves a world-class, working waterfront. To accomplish this, we need a thriving fishing industry. Downtown San Diego can be known for its healthy, sustainable seafood; its strong fishing heritage; and its beautiful, fully operational fishing harbor accessible to all. Support food security, economic value, our cultural identity. Support local fisheries. https://youtu.be/jhaCp2dD1s0 Show your love and appreciation for local fishermen by sending them to Slow Fish 2016 in New Orleans this March! Slow Food Urban San Diego is sending two fishermen. Support the campaign to help send more from around the world! Slow Fish 2016 will bring together fishermen, chefs and other fishing community stakeholders from around the world to highlight successes and challenges in bringing good clean and fair seafood to all: from changing ecosystems to variable fish stock health; privatization of the public resource to issues surrounding fair price and working waterfronts; and how we can improve access to fresh local seafood. Slow Food Urban San Diego (SFUSD) joined the San Diego Food System Alliance (SDFSA), local fishermen, scientists, government leaders and community partners this week in celebration of local fisheries. On December 7, 2015, more than 100 fish-loving friends gathered together at the waterfront Manchester Grand Hyatt San Diego for inspiring speeches, a lively panel discussion and delicious local seafood served in honor of the recent passage of the “Pacific to Plate” bill AB226. The new bill, sponsored by Speaker Toni Atkins (D-San Diego) and signed into law in October by Governor Jerry Brown, allows fishermen’s markets to operate as food facilities, vendors to clean their fish for direct sale, and multiple fishermen to organize a market under a single permit. Put simply, the bill makes it easier for fishermen to sell directly to the public, much like farmers can. The process to develop the bill sprung from the early success of Tuna Harbor Dockside Market (THDM), which opened to the public in August 2014 and averaged more than 350 customers and 1.1 tons of seafood sold each week in its first months of operation. Recognizing the potential of a longer-term, direct-to-consumer market (the original operated under a temporary permit), County Supervisor Greg Cox, the County’s Department of Environmental Health, Port Commissioner Bob Nelson, the Unified Port of San Diego, California Sea Grant, NOAA, California Restaurant Association, The Maritime Alliance, California Coastal Conservancy, the local media, fishermen, researchers and supporters collaborated to draft a bill that met the desires of local fishermen and consumers. It received unanimous support in the California Assembly and Senate. How does the new bill align with Slow Food’s mission of Good, Clean and Fair Food for All? Good: The bill makes it easier for local fishermen to sell directly to consumers, and eliminates added transit time and processing/freezing compared to seafood imported from other countries or regions. The fish sold at THDM is caught by San Diego fishermen in local waters, most of it coming out of our oceans no more than a couple of days before it ends up in consumers’ kitchens. If you’ve ever tasted fresh caught sea urchin (a San Diego local favorite), you can tell the difference - big time. If you haven’t, get yourself down to THDM for an uni scramble or shooter. Your taste buds may never be the same. Clean: Local sourcing means a smaller carbon footprint - no added fuel costs for fish flown or trucked to our markets from other states and countries. And US fisheries are among the most stringently regulated the world, meaning that if there’s a problem – either we’re fishing them too fast, there are too few or we’re catching protected species, we are mandated to do something about it. Our fishermen are required to stop fishing, slow fishing, or change fishing practices in some way to ensure we’re fishing sustainably. San Diego’s seafood is wide-ranging indeed. We don't have just tuna and shrimp (two of the most commonly eaten seafood products in the US) in our waters. 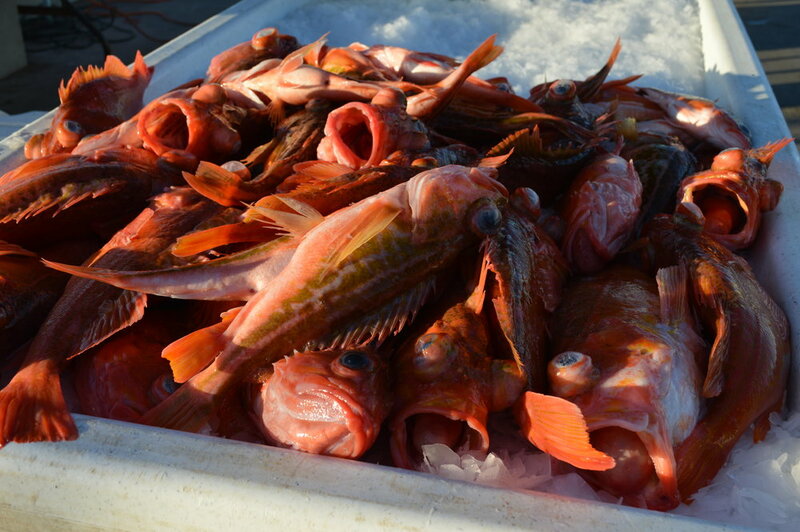 Our harbors and oceans are full of rockfish (dozens of species! ), crab, lobster and snails, among other smaller fish like sardines, sand dabs, and mackerel. For All: The direct-to-consumer market allows fishermen to run specials when they catch a big run of fish, passing the abundance onto consumers in the form of lower prices. The passage of the Pacific to Plate bill is a major milestone in bringing good, clean and fair seafood to all San Diegans. So what’s next? Lack of infrastructure for San Diego fishermen to offload their catch at local docks. Logistical constraints including limited market hours (currently Tuna Harbor Dockside Market is only open Saturdays from 8 a.m. until around 1 p.m.) that make it hard from some consumers and chefs to get there. Limited awareness among locals and visitors that the market exists, where else they can buy local seafood, and how they can prepare the less well known seafood produced locally. Stay tuned for local efforts to address these issues. In the meantime, SFUSD is seeking local chefs and community partners interested in collaborating on these efforts. Contact us to learn more. And, be sure to pay a visit to THDM to see these fish tales come to life. While you’re there, make sure to ask your local fishermen for their favorite seafood preparations! Update on the Pacific to Plate Bill We need your support! Thanks in part to the Slow Food community's support, Speaker Atkins’ fishermen’s market bill, AB 226, has advanced to the Senate. The bill must now repeat the committee process, and has been assigned to start in the Senate Committee on Health. Because the bill is now in its second house, we ask that you continue your support by submitting a new letter, this one addressed to the Senate Committee on Health. An updated sample letter is below with the new address. The bill is not yet officially scheduled for a hearing, but there is a chance that it could be brought forward in the coming weeks, so to ensure that your support is captured in the official record we are asking that letters be submitted this week if at all possible. Send your letters to the CA State Senator Ed Hernandez or San Diego County, Thomas Ledford: Thomas.Ledford @ sdcounty dot ca dot gov by June 10, 2015. Slow Food Urban San Diego is excited about the new proposed legislation that will help California fishers get their products to Californians. State Assembly Speaker Toni G. Atkins (D-San Diego) has introduced legislation, "Pacific to Plate," to clarify and streamline state laws to make it easier for San Diego's Tuna Harbor Dockside Market, and other fishermen's markets like it, to grow and thrive. See how you can support California's fishermen's markets and the Pacific-to-Plate bill below. Slow Food Urban San Diego and Slow Food California Support this legislation. Current laws and regulations in California do not define fishermen's markets so prevent them from easily obtaining permits to operation. Current laws and regulations do not allow fishermen to clean fish for direct sale to consumers. Current laws allows direct fresh-caught fish sales to occur only from permanent, temporary, or mobile food facilities where permits are required for each participating fisherman or aquaculturist. 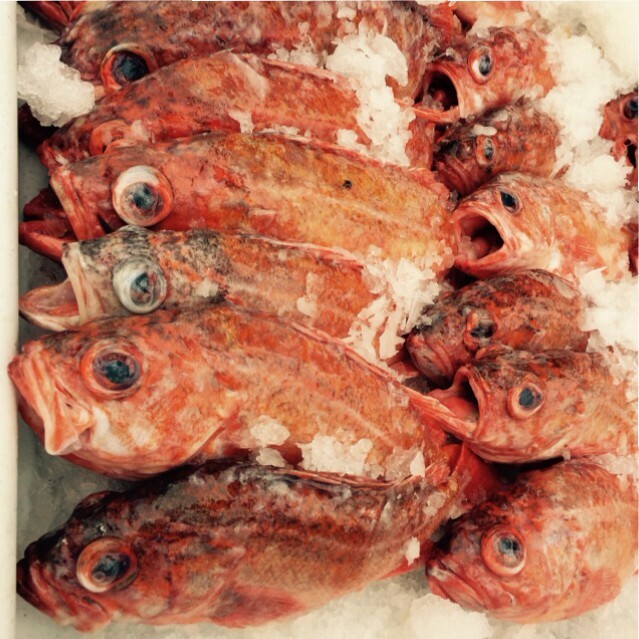 Designates Fishermen's Markets as “food facilities” in the California Retail Food Code. Exempts evisceration of whole raw fresh-caught fish at a Fishermen’s Market from the definition of food preparation to allow fresh-caught fish to be cleaned by the fishermen for direct sales to the public. Establishes a separate Fishermen's Market chapter in state law, specifying the operational requirements (modeled after requirements for Certified Farmers' Markets) to allow commercial fishermen and aquaculturists to organize under a single permit holder for the market. Clarifies that food facilities that sell certain products such as whole fresh-caught fish can have an open front. Fishermen’s markets allow fishermen to sell local seafood direct to consumers - providing fresh seafood with a lower carbon footprint. The Pacific-to-Plate legislation streamlines the permitting process, so that fishermen can sell direct to the public. Fishermen's markets provide a place for fishermen to collaborate and plan what they'll fish - leading to more sustainable fishing practices, like fishing lightly across a wider variety of fish. More fishermen's markets means more fresh fish available at better prices to the consumer. Fishermen's markets, like farmers markets, connect the community to their food producers and the food producers to their community.